Not everyone should buy foreclosed homes. The process is more complicated than in the case of a traditional sale, since banks require several layers of approval for foreclosures, and it also lasts longer. The upfront costs run high and most such homes are sold as-is. But if you have the cash, the time, and are potentially looking for a home to flip, foreclosures are the way to go. Since foreclosures tend to sell very fast, buyers who have the cash upfront have the best odds at securing the transaction. If this is not an option for you, we recommend to stay away from this process. There are many reasons why only a very experienced investor should get involved in a financed purchase of a foreclosure. Access a nationwide or local database of properties for sale—this can be either a typical site advertising homes for sale, but also a government website or bank database. Filter the results by foreclosures or REOs (real estate owned) and find… no, not a future home, but an agent. Usually, one or two realtors handle all foreclosures from a single bank. In particularly overcrowded, big city markets, you’re probably not going to talk to said broker too much, so make sure to directly approach the lender. Foreclosures are sold in two different ways: via an agent (or, as explained above, directly from the bank, in busy markets), or at an auction. Typically, foreclosures are put up for public foreclosure auction. If they’re not sold in the process, they are then listed with a real estate agent, point at which you can buy the property from the bank. Finally, if the home doesn’t sell like this either, the bank transfers it from the agent to an auction company. Both when buying through an auction or directly from the bank, the biggest difficulty a buyer faces is to figure out whether or not the property is priced appropriately. For auctions. Understand that, given the dynamic nature of both auctions and foreclosure sales, you don’t always get to inspect the home in person, prior to the sale. You might also have to bring in a certified deposit check, to prove you have the funds. To get the hang of auctions, try attending at least a few before you bid in one yourself. For dealing with the bank. Estimating the price is guesswork in this case, too. That’s because sometimes banks will price the properties very low, but at other times they’re high priced—and your best bet is to write an offer that’s as high as you can afford. Also bear in mind that most foreclosures require hefty additional expenses for repairs and other costs (such as uncovered property liens). Banks don’t typically offer discounts for such cases, and, more often than not, are not even aware of the current state of the property in question, since they do not directly manage it. To get a rough idea of the comps (comparative market prices), also look at how fast the type of property you’re interested in is selling. If they’re going like hotcakes, just come in strong, or you end up regretting not bidding that extra $5,000 for the win. 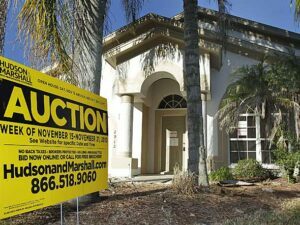 Usually, if you can’t inspect a foreclosed home before buying it, you can expect the worst. And even if you do, don’t expect to always detect the issues. Some, like mold in the walls, pest infections, or even de-winterizing the home (so it can be inspected) are not immediately evident for the untrained eye. Before buying a foreclosure, it’s usually a good idea to get to know some repair professionals in your area, as well as to approach a licensed home inspector. Also expect major appliances to be amiss in REOs, since the previous owners have likely sold them for extra liquidities. It’s not uncommon to find out that a foreclosed home had attached liens, so check for any such debts via a title company. It’s usually a good idea to have a professional with prior foreclosure experience on hand, when dealing with this. Bottom line: be very careful and do your homework! The upside is that you will definitely learn a lot in the process of buying a foreclosure. The downside is that the lessons may turn out to be very expensive.